Of Angola’s 5,000 inmates, 90 percent are expected to die in prison because of their life sentences. For a time, those who died and were unclaimed by family were handled rather unceremoniously. When Warden Burl Cain arrived at the facility he sought to change that through a program that would instill more respect for the dead and create a sense of dignity for those still alive. 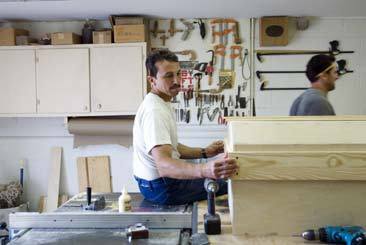 The inmates agreed, and a small group of them began building birch plywood caskets. Also around this time, Angola graduated its first inmate preachers through a bible college program run by Louisiana State University. “We decided to build a horse drawn carriage and pull the coffins to the cemetery. We thought we’d have a real fancy funeral and the inmates could preach it,” he adds. The new ceremonies generated immense feelings of pride among the inmates. 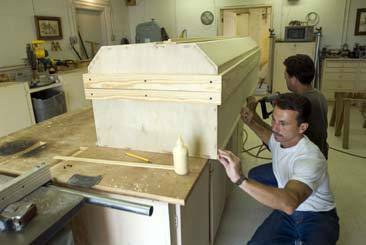 Over the years, there have only been two or three coffin-builders at a time, but, according to Cain, “they always stay three ahead”. 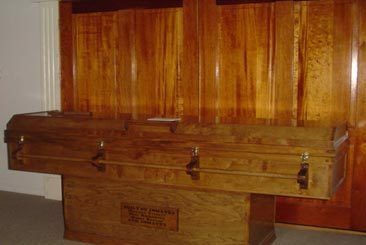 In 2005, the modest coffins received some high profile attention. Preacher Billy Graham’s son, Franklin Graham, visited Angola to preach that spring. He then stopped by the Louisiana State Penitentiary Museum and made an unexpected request. The coffin-builders at the time, Eugene Redwine and Richard “Grasshopper” Leggitt stepped up to the task. Ruth Bell Graham, Billy Graham’s wife passed away on June 14 this year. Pictures from the funeral service on the Billy Graham website show Redwine and Leggitt’s casket covered with white flowers and red roses by each of the preacher’s five children. 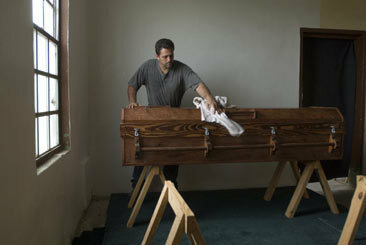 The coffins have done more than just transform the way an inmate’s death is handled. They’ve contributed to a facility-wide cultural change. “In our business, when an inmate starts giving back and starts being unselfish. That’s the first sign of being rehabilitated,” he says. When he became Warden, Cain says, about 400 inmate-on-inmate acts of violence were committed each year. That number has dropped to between 70 or 80 conflicts in the last two years. He also claims Alabama’s recidivism rate for 2007 has dropped to about 39 percent. Cain attributes this success to promoting moral themes. Angola won’t be looking to compete with the private coffin-making business anytime soon, but the program continues to be a powerful symbol for a community that now strives to lookout for their brothers, including the ones that have passed on. i will tell you later.i will tell you later.i will tell you later.i will tell you later.i will tell you later.i will tell you later.i will tell you later.i will tell you later.i will tell you later.i will tell you later.i will tell you later.i will tell you later.i will tell you later.i will tell you later.i will tell you later.i will tell you later.i will tell you later.i will tell you later.i will tell you later.i will tell you later.i will tell you later.i will tell you later.i will tell you later.i will tell you later.i will tell you later.i will tell you later.i will tell you later.i will tell you later.i will tell you later.i will tell you later.i will tell you later.i will tell you later.i will tell you later.i will tell you later.i will tell you later.i will tell you later.i will tell you later. It is obvious to anyone who has met Burl Cain that he leads Anglo with his heart. It is evidenced by the coffin program and countless other programs he has intiated that have great meaning for inmates. Not everyone in positions of responsibility thinks in that way. Burl is unique. This was such a good article. Well told and written. We need to read more about affirmative things taking place, encouraging us that our work is not wasted time and energy, that dedication to this correctional work makes a difference somewhere. Lead on.